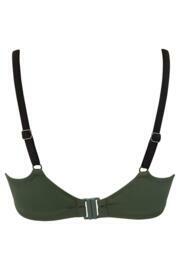 This Underwired top features convertible straps, which can be worn criss-crossed or as a conventional two strap. On trend styling trimmed in black elastic across the bust. Finished with black straps and clasp at the back. Matches perfectly with the Amnesia High Leg Brief. I really liked the product, just hotbed to work out how to put it on properly! Great bikini lovely and comfortable ? ?